An outstanding venezuelan musician and master guitarist. 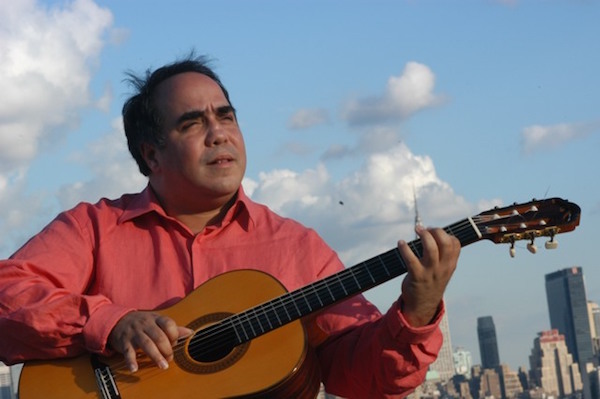 Aquiles Baez is a true Latin-American’s multi-chord instrumentalist performer, arranger, and composer. His instrumental execution delivers an innovative and personal style, incorporating sophisticated harmonies, within Latin American’s newborn rhythmic elements. Aquiles has successfully accomplished seventeen of his own record albums , along with numerous collaborations in the company of well-renowned artists such as Paquito D’ Rivera, Farred Haque, John Patitucci, Ilan Chester, Mike Marshall, Aquiles Machado, Ed Simon, Richard Bona, Giora Feidman, Raul Jaurena, Ensamble Gurrufio, Simon Diaz, Nana Vasconcelos, Luciana Souza, Lucia Pulido, Cecilia Todd, Worlds of Guitars, among others. He had also participated with major world orchestras such as the “Brooklyn Symphony “, “Ravinia Festival Orchestra”, “Boston Symphony”,”Atlanta Symphony”, “Simon Bolivar” and “Bach Academy”.Likewise, he has appeared in numerous documentaries such as Fernando Trueba´s “54 Street”, as well as Grammy nominated albums “Motherland” and “Central Avenue” featuring legendary pianist Danilo Perez and ” La Pasion segun San Marco” from composer Osvaldo Golijov.He had been also member of “America Contemporanea” collective with musicians of seven countries of south America conducted by the Brazilian pianist and composer Bemjamin Taubkin .Throughout his career, Baez has received a number of notorious awards. Among those included is the Venezuela’s national prize as musical arranger of the year, and the William Leavitt award from Berklee College of Music; along with a variety of prizes as movie, dance, and music theater composer. Baez has performed in musicals and concerts all over Europe, Asia, South and North America. At the same time, he has worked as faculty at Berklee College of Music. Likewise, he has dictated workshops and seminars throughout major universities in the U.S and Europe. Lucia Pulido "Dolor De Ausencia"
No Replies to "Aquiles Baez Trio"